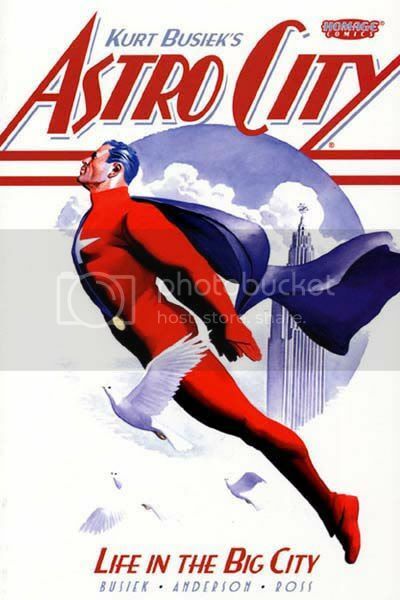 Buy, Rent or Skip Astro City: Life In The Big City? I've been hearing nothing but rave reviews for Astro City for quite some time now. But I always had another book to read first and I just kept putting this one off. So, I finally got around to reading Astro City: Life In The Big City. So, did it live up to the hype? Unfortunately no. It's not a bad read, but I do think it's a bit overrated. Look, I like Kurt Busiek's writing, but I think I'd be doing a disservice by just caving into peer pressure and agreeing with everyone about the awesomeness of this book. Sorry, but it's not. The entire Volume consist of individual chapters that look at the Super Hero world, or Astro City in which Caped Crusaders and whatnot is a common thing. The story centers around the citizens of Astro City and what their take is on these people running around in tights and what it means to them. For that angle, I actually like it. What I don't like or even get is that these people can take these Super Heroes serious. How can we the reader expect to take these citizens serious when the people they worship look stupid? Their names are stupid. Their costumes are atrocious. It's every bad cliche you can think of when showing us their powers and how they talk to each other when fighting. Maybe that was the point? I don't know. But for me, it comes off like they just half-assed their way when designing the characters and drew names out of a hat when it came time to name these Heroes. And it was because of these Heroes that I had a hard time buying into the world of Astro City and it's occupants. Of all the chapters, there really were only 2 that I enjoyed. The one about the random crook that discovered the identity of a Super Hero and then plots to use the information to sell to the highest bidder for financial gain. The other chapter about the two hero's going on their first date with each other only to find that they can't agree on how to properly save people was a bit amusing, in a non intentional way. The rest of the book was just okay at best and sleep inducing the rest of the time. I also come from a certain era of pencilers and like clean lines. Not to take anything away from Brent Anderson as an artist. It just that his style is not my cup of tea. So, that's my take. I give this 3 Stars out of 5. This is nothing more than a Rent for me.